Quick, what existing social network is Google+ most likely to displace in terms of people’s time? This isn’t a Facebook-killer, it’s a Twitter-killer. A hearty congrats to Google for creating an offering that manages to be compared to both Facebook and Twitter. The initial press focused on Google+ as a Facebook competitor. But as people have gotten to play with it, more and more they are realizing that it’s just as much a Twitter competitor. Why are people thinking of Google+ as competitor to both existing social networks? How did the Google team make use of the best of both services? The chart below is shows where Google+ is more like Facebook or Twitter. The red check marks (√) and gray shading highlight which service a Google+ feature is more like. A few notes about the chart. Circles for tracking: Twitter has a very comparable feature with its Lists. Facebook also lets you put connections into lists; I know because I’ve put connections into lists (e.g. Family, High School, etc.). But I had a hard time figuring out where those lists are. in the Facebook UI. Seriously, where are they for accessing? They may be available somewhere, but it’s not readily accessible. So I didn’t consider Facebook as offering this as a core experience. +1 voting on posts: Both Google+ and Facebook allow up votes on people’s posts.Twitter has the ‘favorite’ feature. Which is sort of like up voting. But not really. It’s not visible to others, and it’s more a bookmarking feature. Posts in web search results: Google+ posts, the public ones, show up in Google search results. Not surprising there. Tweets do as well. Facebook posts for the most part do not. I understand some posts on public pages can. But the vast majority of Wall posts never show up in web search results. When you look at the chart above, on a strict feature count, Google+ is more like Facebook. It’s got comment threading, video chat, inline media, and limited sharing. But for me, the core defining design of Google+ is the one-way following. I can follow anyone on Google+. They may not follow back (er…put me in a circle), but I can see their public posts. This one-way following is what makes the experience more like Twitter for me. Knowing your public posts are out there for anyone to find and read is both boon and caution. For instance, I’ll post pics of my kids on Facebook, because I know who can see those pics – the people I’ve connected with. I don’t tend to post their pics on Twitter. Call me an old fashioned protective parent. That’s my initial impression. Now as Google+ circles gain ground in terms of usage, they will become the Facebook equivalent of two-way following. Things like sharing and +mentions are issues that are hazy to me right now. Can someone reshare my “circle-only” post to others outside my circle? Do I have to turn off reshare every time? Does +mentioning someone outside my circle make them aware of the post? Google has created quite a powerful platform here. 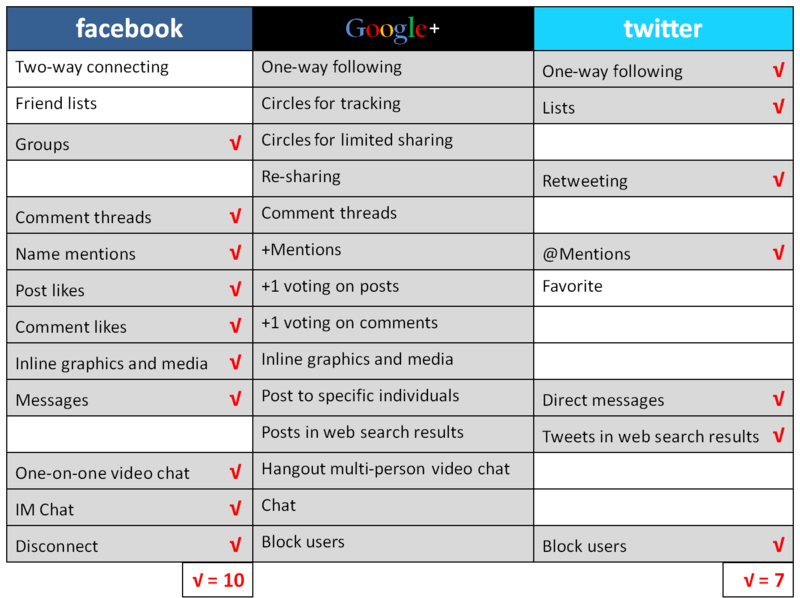 While most features are not new innovations per se, Google+ benefits from the experience of both Twitter and Facebook. They’re off to a good start. Thanks for the post. Good information. I don’t feel the need for another social media, but you’ve piqued my interest. I was similarly reluctant initially. But the Google+ team has done a really nice job with the site. Good read. I like the graphic. Just a couple of quick points. Twitter favorites do show: ( http://twitter.com/#!/Thos003/favorites ) and you can get notifications when you tweets are favorited. …but I agree not quite the same as likes and +1. My other question is on the Google Plus showing in search results… Do you have a screen shot of this? I would love more info on it. Thanks. Re: the Google search results. It was actually a Google Alert on my vanity search. Got the alert for “Hutch Carpenter”, and it had one item. A G+ post (https://plus.google.com/113312618768961578323/posts/WrmDo3W7c59?hl=en). As a secondary check, I ran a search on the key terms of that post: ‘google 9x better facebook’. In my Google search, that G+ post shows up as the #3 item. Nice feature analysis, but what I think it’s a bit early to say for G+ is: what are people really doing on the tool? Twitter has always been a very eclectic mix – promotional tool, conference chat room, networking conduit. One of Facebook’s killer usages has been photo sharing (with tagging and comments). G+ is very open ended. Without search (which we’ve been assured is coming), I don’t see it competing with Twitter (although it is having a visible impact on the Tweet traffic from the Silicon Valley early adopters). And the competition with Facebook is basically being a place where the same tech crowd can go do similar things to Facebook without the family or “high school friends”. We’ll see how sustainable the engagement is. Of course an iPhone/iPad app would make me more likely to update more. There’s little things they need to do. For instance, I’d love to find “re-shares” of posts, which is easy with the Twitter equivalent retweet. Search will be good (and could solve finding the shares). There is a FriendFeed aspect to Google+, and remember FriendFeed was the darling of the SV crowd for a while. Until it wasn’t. The chart above indicates that Google+ should be better than Twitter and Facebook, but history has shown that the better mouse trap does not always win. Twitter and Facebook have the first mover advantage and a very large established user base, Google+ must bring a new innovative idea to the table. I’s day Google + is more like a mix between Facebook and Twitter. Or, i’d say, it is Facebook with the privacy of a Twitter. good information to make difference between them. Helpfull for my classes. Thanks! Google+ is actually pretty amazing, just needs a couple tweaks but it’s pretty fun.